Rossie posted about her article for QuiltCon magazine on group improv. Several people from our guild had a hand in these two awesome quilts that were in the show this year; head over to her post to check them out. 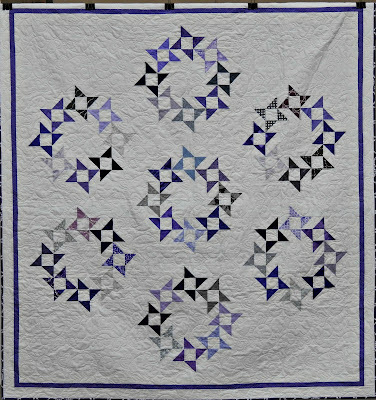 Lynn shared another feature quilt from her book, Every Last Piece. This one is called Square Dance. She's also a designer for the Splendid Sampler and is sewing along with that, and she has been doing some mini finishing and some work with that applique project. Debbie G. has her February Charity Challenge post up, with a completed quilt called Butterflies, and the pattern for the next one, Connext. 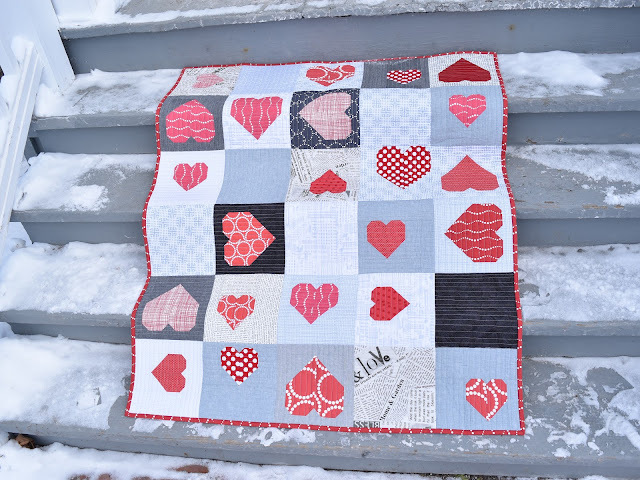 Karen made a quilt featuring lots of hearts, "All Ways", using blocks constructed from a Cluck Cluck Sew tutorial. Pam L. has several new posts, one of which is a completed Round and Round. Also she is looking for strings sewn end to end into long skinny strips, if you are interested in helping her out with scrap diversity. And finally, Dorie has a pattern included in a newly released book, "Scraps, Inc. Vol. 2", called Chimney Swifts! Riley Blake Challenge - looks like we don't have anyone in the Guild participating. Let the Board know if this is not the case (fabric will be shipped to Guilds only). QuiltCon - Dorie & Rossie attending (anyone else?). Rossie promises to give the Guild quilts in attendance her attention and possibly take photos. Was held at Hankerd Inn on Jan. 14. Amanda will send a survey out to ask for feedback and other location options (e.g., St. Johns). Ellen would like photos of your quilts since UofM will want to see them to decide on the space. Submission would probably be in February. Email Ellen erfrank23@gmail.com as soon as possible with photo, size, brief description and/or any questions you have. Also continue to send her ideas for other locations/venues. "Members are allowed access to the Guild Social Media Group(s)." New Librarian so no books to preview. Contact Kim if you want to see any particular ones at next meeting. Let Emily know if you have swap ideas. Kathy K brought extra batting from her business to be taken away to be used for whatever (charity quilts, your own projects). Congrats to Amy Diebold on the birth of her son on Quilt Meeting Day. Wesley Christopher was born on 1/27 at 11:02am, 11lbs 6 oz, 22in. Cards from National MQG will arrive after Jackie files our membership. 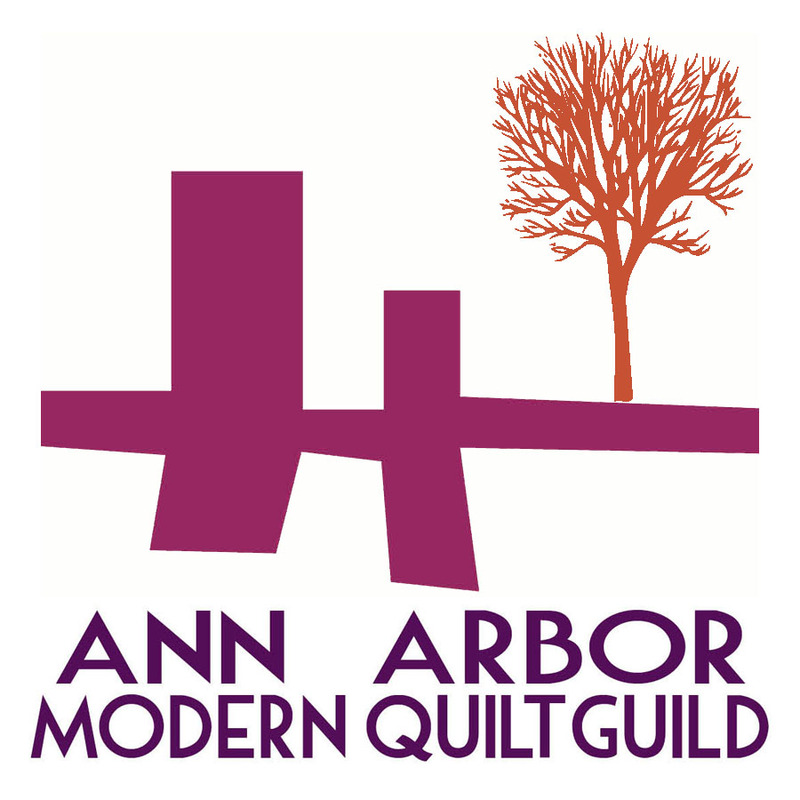 Amy Stevenson and others offered to bring their die cutters if members want to hang around after the meetings and cut up fabric. See the Facebook page for her list of dies.